Declutter, as less is the new more ! The idea to declutter took a different meaning at different stages of my life, because what was important at that point in time decided what I needed and didn’t. 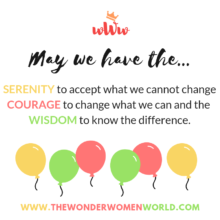 The need to get rid of things arises because all that we hold close to our hearts may lose importance later and are simply there to add to the ever increasing pile up. As we grow and evolve, letting go of things and people (realizing what lies beneath , with experience) feels great! When we are filled with inner clutter leading to chaos and confusion it surely shows in our personalities too. I have moved all over the country collecting and amassing things and now happily give them away to people who could use them to their benefit. Being associated with two such NGOs as a volunteer it surely feels good to part with things that are no longer of any use but in good condition and can be used by others. Thus decluttering in the process. We need to clear up spaces in our homes and hearts from time to time, for new experiences by doing away with things, toxic relationships, painful pasts and bad habits. Someone rightly said, “The more things you own , the more they own you’’. 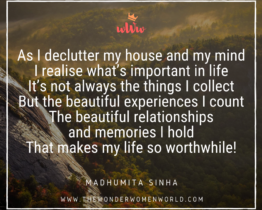 So each time I choose to declutter, I free my house and my mind of unnecessary baggage. If your life too feels cluttered sometime just go on a minimalist mode and feel lighter and happier . I end here with my verses…. That makes my life so worthwhile.